OK, it's not me. I rode a Schwinn StingRay -- Gold. Farther along on my route during this collection day, a retiree set the exact dollar amount for the week’s paper, along with a second pile of change for a tip, outside of her door. She left a note that said, “Couldn’t be here today, but I knew you would come by to collect.” I always did my collections at the same time on Friday afternoon. Waking up every day at 5:00 a.m. to deliver the morning Detroit Free Press as a 12-year-old taught me invaluable lessons. Here are the five top lessons that have helped me in leadership roles all along the way. Customer Pays You: With a paper route, the only way you got paid was by going door to door and collecting. This direct exchange of cash between the customer and me gave weekly feedback on the quality of the product and service. The only way I got paid wasn’t through the company. It was through the customer. Often, the customer can get lost in the mix of everything, but as a paperboy you understood — they were No. 1. Don’t forget the customer. 10% Factor: I found the more I did the little things, like leaning a paper against the door so that my customer could keep her full independence, the more the customers responded in both dollars and strength of relationship. Doing the extra 10% as a paperboy seemed to produce different results than my friends who didn’t. The 10% mattered then as it does now. View the Whole Enterprise: One of the key things I learned from a paper route was to think through the whole enterprise versus just my part. Now, at age 12, I didn’t understand the full scope of the publishing business. But what I did understand was that the baseball game I listened to going to sleep was written by a reporter. In turn, that story ended up in the stack of papers outside of the barber shop where I picked up my bundles just a few hours later. How I folded the paper, tossed or placed the paper mattered. And in a few short minutes, my customer was going to read what I fell asleep to listening. That, to me, was magical. I always wanted to understand a business from the beginning to the end. Make Your Morning Count: I learned from my paper route you could get a lot done before the rest of the world woke up. Riding my Schwinn StingRay through the neighborhoods while it was quiet and dark taught me to make my mornings count. I always remember the satisfaction I got from completing my route, stopping at the bakery to get the first warm doughnut made, and walking through the door of my house knowing that most others were just starting their day. A daily ritual of making my morning count has always served me well. I’m Accountable: If I didn’t deliver by a certain time of day or someone got missed, I received instant feedback. I learned from the route that I was the sole person accountable to deliver on the promise of having the paper on the front porch by 6 a.m. That early experience taught me to be unafraid of being held accountable. There was great satisfaction in delivering on a promise. 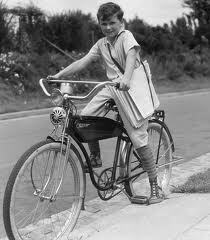 The American Paperboy experience has gone away. In that, we lost an incredible pathway of experiences for learning as a child. To this day, my paper route is something I cherish. I have always attributed the experience of getting up at 5 a.m. every day– rain, snow or otherwise — as a terrific building block for taking on leadership roles down the road. What early job taught you the most? My son delivered the Ann Arbor News for two years and eleven months–the route usually changed hands right after Christmas. Like you, MIke, and your story about the customer in the wheelchair, he had one where he’d knock on her window so she could come to the door to take the paper from him. She wasn’t all that interested in the paper–more interested in having a daily visitor. He had several customers like that. I often thought that if you had to be female and over 70 to vote, he could have been mayor. Thanks for sharing Terry. Your son sounds terrific…just like his Dad! Well normally the people who are deprived of all the wealth at the start are the CEO of future’s best companies. Because they know what hard work means.